Sterling, 1978-01. Library Binding. Good. Sterling Pub. Co, 1978. Paperback. Good. London, Melbourne & Capetown: The Oak Tree Press, 1964. Visual Geography Series. 64pp illustrated throughout with black and white photographs. Bright gilt lettering to front board and spine. Slight tilt to spine and minor bend to boards, otherwise very good copy with no inscriptions. Unclipped DJ has slight internal foxing and some edgewear, otherwise very good.. First Edition. Blue Cloth Boards. Very Good/Very Good. 4to - over 9¾" - 12" tall. Sterling, 1978. 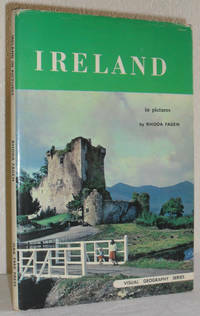 Part of the Visual Geography series, a 64pp photographic tour of Ireland. Biro'd price on cover otherwise a clean solid copy.. Soft Cover. Good. 8vo - over 7¾" - 9¾" tall. Sterling Pub. Co. Used - Good. Good condition.